Google just published Android 4.4.4 factory images for Nexus 4, 5, 7 and 10 on the official site. Currently, Android’s latest version is not available via an Over-the-air update. Additionally to that, you might not be able to get an over-the-air update if your phone or tablet is rooted. If you don’t want to directly flash stock images (which will wipe all your settings), here’s how to get Android 4.4.4 with a rooted Nexus device. Of course, if your device is not rooted you can still use this guide to get the latest Android version before the OTA without losing your settings by completely wiping your device. I’ll use the Google Nexus 4 as an example, but the same steps apply for the Nexus 7 (2012 & 2013), Nexus 4 and Nexus 10. After downloading all require files and programs you’re ready to go. The first step is quite obvious: Connect your Android device to your computer using an USB cable. Make sure to enable USB debugging as it is required for the following steps. If you’re not sure if USB debugging is enabled or not, check the Developer Options in the Android Settings menu. If the menu is not visible, it’s still hidden and you need to unlock it. To do so, head over to About Phone in the Settings menu. Tap Build number a few times until your Android device states “You are now a developer!”. That’s it – you should be able to enable USB debugging. Open Nexus Root Toolkit and allow the USB debugging connection on your Android device. 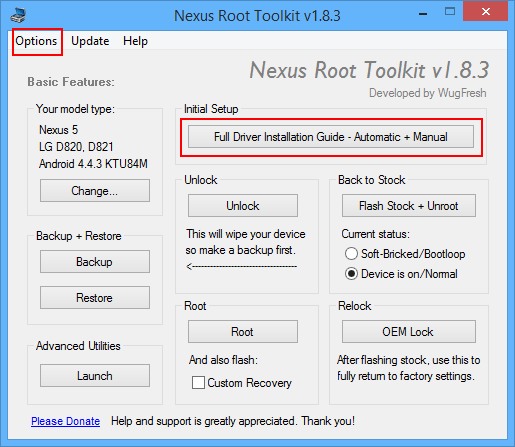 Next the Nexus Root Toolkit menu will pop-up. First, go to the Options and head over to the Flash Stock tab and tick the box next to Enable “No Wipe Mode”. This will prevent the stock images from wiping your data. Next, it is important to install the proper drivers which can be done in the Initial Setup menu. Simply follow the the steps and you should be good to go soon. You are now able to flash Android 4.4.4. Click the Flash Stock + Unroot button while having Device is on/Normal status checked. On the next screen select “Other/Browse ..” and “I downloaded a factory image myself that I would like to use instead”. In the next window you’ll be able to select the Android factory images you downloaded earlier. If the program asks for an MD5 number, take the correct one from Google’s factory image page. The next steps will guide you through the process and you should be done quite soon. Your Android device is now running Android 4.4.4. However, your device is not rooted anymore and does not have a custom recovery installed. Head over to step 4 to fix that. Step 4: Flash custom recovery and re-root your device. Almost there! Go back to the main menu and click the Root button while having Custom Recovery checked. 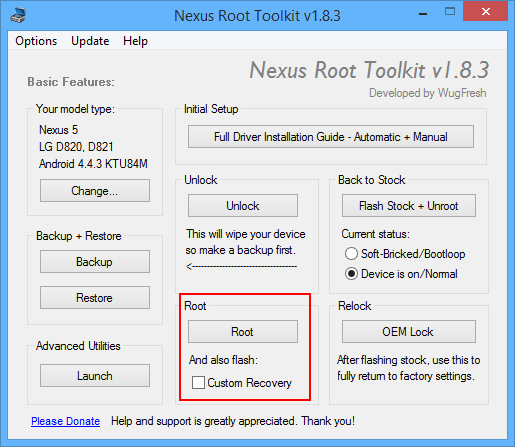 Nexus Root Toolkit will guide you trough the necessary steps and you should be done in a few minutes. That’s it – you are now running the latest Android version with root access. I would recommend flashing Xposed framework to get more out of Android or flash a custom ROM. Interested in more Android-related articles? Have a look at our overview. We are not taking any responsibility for damage done to your Android device.